In the professional world, it is often said that ‘Business is all about relationships’. This includes relationship with the professional members, such as management, employees, customers, suppliers, vendors and so on. Maintaining a cordial relationship at work is essential to flourish and thrive in a career. How you communicate with your seniors, subordinates and colleagues or the audience community at large, plays an important role in shaping your career. Therefore, at times when the situation demands, it is fine to apologize. Think of the following four questions and handle the situation accordingly when you plan to apologize. 2. What are you apologizing for? 3. How would you apologize? 4. When should you apologize? When you will think on these, you will definitely find the way for apologizing at the right time with the right way. Here, some phrases are mentioned which showcases a descent way to apologize and helps to rebuild the business relationships. 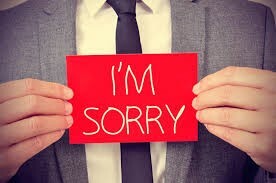 This is the simple kind of apology which can be used as a phrase to be used after realizing your own small mistakes or even it can be used when you are unable to do something for someone. I am very sorry for breaking your glass. I am so sorry that I will not be able to come for the party. I am extremely sorry for being late for the meeting. This is the stronger and more formal kind of apology which is to be used in front of superiors when any mistake happens. I sincerely apologize for not completing the work on time. I would like to apologize for missing the deadline of our target. I apologize for postponing the meeting. This phrase is also a kind of more formal word of apology which is generally used to convey any kind of bad news to our superiors. I regret to convey that employees who work under you, are not that much enthusiastic for the effective results for our company. I regret to inform you that no one got selected in yesterday’s interview round. This shows that you are taking responsibility of your mistake and you are really concerned regarding the situation and the person for whom you are apologizing. It was my fault and I promise not to repeat it. This is more formal way of apologizing which is used for conveying a mistake to the superiors in the office. Please accept my apology, I will correct the work and rectify the mistakes. This kind of apology is generally conveyed to our colleagues and subordinates. I spoke harshly with you in front of all. I hope you can forgive me. Hope the above explanation cleared the way of conveying an apology in front of all the stakeholders in a professional environment. Browse our other similar articles which will enhance your English communication and grammatical skills. You can also download the Simple English App and join our Online Spoken English course and make learning simple. 3. How to discuss about appraisals with your manager? 4. How to make a browsing customer comfortable and convert?